The Tool Library is teaming up with GOBike Buffalo to bring tactical urbanism to Bailey Avenue! What is tactical urbanism you ask? Tactical Urbanism is all about action. This approach refers to a city, organizational, and/or citizen-led approach to neighborhood building using short-term, low-cost, and scalable interventions to catalyze long-term change. Tactical Urbanism projects share common goal of using low-cost materials to experiment with and gather input on potential street design changes. Over the past decade Tactical Urbanism has become an international movement, bringing about a profound shift in how communities think about project development and delivery. 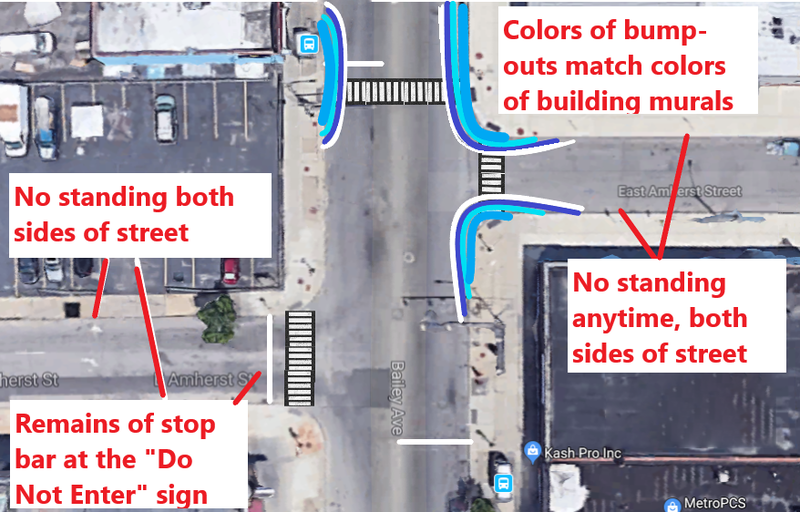 A preliminary diagram of the improvements to be made at the intersection of East Amherst Street and Bailey Avenue. Help GOBike learn more about this intersection and what sort of additional improvements can be make by filling out their survey.